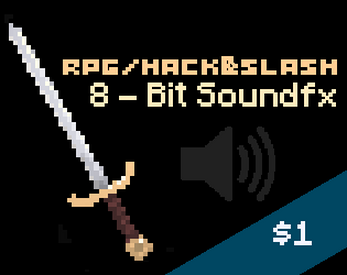 Info: A small collection of 8-bit Soundfx perfect for an RPG or Dungeon Crawler/Hack&Slash type game! - Coin, Points, Start Button, and a Swirlysound! - AND 6 Short Music Loops! I keep getting an error that says "Unsupported Compression Method" when I try to unzip it. I WANT YOUR SOUNDS, BRIAN! Ah crap I wondered if that was gonna happen! Give me a sec and ill re-upload..! Let me know if its fixed! It unpacks properly now, but Is "prettyloop" suppose to have that blast of static at the end? Otherwise, very solid stuff! I love the sfx! Thanks for pointing out that its messed up! I'll see if i can find a version of it that isnt corrupted like that.. I might have to cut it down and loop it so its shorter, which would be unfortunate. (but only if i cant find it on my old harddrive) I'll let you know what happens! First i gotta find my old harddrive.. haha..
Glad you enjoyed the sfx! thanks for the purchase & sorry for the trouble! These are my first few assets ive added onto itch & taking some time to work out the issues especially since those sfx are really pretty old! I couldnt find the original file so unfortunately have to just cut down that music loop. =( What a shame that was my favorite one! I am sorry for any trouble & because of this error I have just added 4 new music loops (+ shortened version of the one that had an error) as well as 4 new sounds to the pack! Well, you're just awesome, then! Thanks for your responsiveness and efforts in all of this!